The importance of a top bench for weight lifting can’t be understated. A weight bench is one of the most important parts of a home gym or any gym for that matter. Choosing the correct style is crucial because you don’t want one that has you spending money on a bunch of extra bells and whistles you aren’t going to use, but if there are additional exercises you’d like to do with your bench, you want to make sure it’s able to accommodate you. After figuring out what you need your bench to be able to do, it’s time to decide how much you want to spend on it. Are you happy with something built for light home usage, or do you want to go all in and get something commercial quality as you’d find in a serious gym? It really comes down to how you’ll be using it, for instance, if it needs to be able to support your weight and hundreds of pounds, or if you’re just going to be using it for light work. This is the simplest and most basic type of bench, it just lays flat. It doesn’t have room for any attachments, but can be used for a number of exercises despite its overall simplicity. This stands for flat, incline, decline. This type of bench can lay flat, and can also be adjusted to have an incline or a decline, which makes it more versatile for different exercises. Even just performing your basic bench press at an incline or a decline will work different sets of muscles, giving you a more complete workout. There are dedicated preacher curl benches designed specifically for this exercise, and they’re also more standard styles of benches that offer a simple attachment that helps with preacher curls. A bench created for doing preacher curls is usually much better suited, whereas the add-on options for standard benches can certainly get the job done, but they don’t quite hit the mark because they feel more like a compromise, rather than the main focus of the equipment. Some benches come with attachments for leg exercises, and others have the option to purchase them separately. These usually aren’t as good as having a dedicated leg machine, but they offer a more practical way to get some leg day work done, especially if you have limited space in a basement or garage gym. As the name suggests, these benches help you to exercise your abs. Some adjustable benches will have padded bars that allow you to lock your legs in place for doing situps and other exercises. These are typically a lot more heavy duty, and for people who are serious about their lifting. They’ll often consist of a number of extra parts and features compared to a standard bench. They’re versatile, sturdy, and they support professional-level bars and routines. We’ve broken down this guide to choose the best weight bench based on different categories, so no matter what you’re looking for, you can find the very best version of it. Our pick for the best flat bench is Marcy’s Deluxe Flat Bench. Compared to some of the cheaper options, it’s constructed with stronger metals and is much more heavy-duty feeling. You do end up paying a bit extra for this higher quality, but a great bench will last you forever, you won’t need to replace it, and it can handle very heavy usage – as opposed to a budget option where you’ll start to feel nervous as you use heavier weights, we’ve even seen some that start to rock back and forth a bit. There’s no rack attached with this one, and nowhere to attach anything else for that matter (Some benches have the ability to add on attachments for preacher curls, etc.) This is all about simplicity, and stability. Do you really need a plain flat bench in your gym when you could get a FID bench, or something with more options? That really comes down to what you’re looking to accomplish in your garage gym, and how much you’re looking to spend. A solid flat bench is a great thing to have in your home gym or any gym for that matter, but if it’s true versatility that you’re in search of, it would be best to keep looking at some of the other options we’re about to explore. GREAT FOR A FULL-BODY WORKOUT - The adjustable utility bench from Marcy is ideal for working out and building up the muscles in your chest, shoulders, back, abs, and more. It's a great unit for a full-body workout, whether you're at home or at the gym. 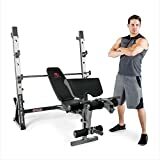 ADJUSTABLE SIX-POSITION BACK PAD - The back pad is highly adjustable and can be set to different angles to help perform chest exercises such as incline, military, decline, and flat presses. The tilting seat can be adjusted to 3 positions to fit any user. Here’s another one by Marcy. This brand does a great job of providing affordable fitness equipment for home use. Their typical gear is usually on the lower quality side, but they also make a line of higher-end equipment like this Adjustable Incline/Decline Bench. While we would definitely avoid some of the cheaper and flimsy Marcy stuff in some cases, when you take a step up from there, you get some excellent quality, highly-reviewed, extremely durable, and very functional gym equipment. This bench can go completely flat, with a high incline, and even a decline. There are two surfaces that you can adjust, the back and the seat, so there’s a ton of different configurations you can get into. Adjusting it only takes a second or two. The rolling wheels make it easier to move around, it’s got great padding, and everything just feels like you’re getting a very high-quality product for a lot less than you’d spend from many other brands. 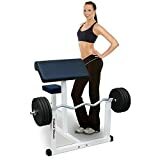 Unit Size: 37" x 41-1/2" x 33"
Deltech’s Pro Preacher Curl Bench is our choice as the best option for home use because it’s affordable, but still a considerable step-up from any of the lower budget options. It hits that perfect sweet spot of being a great value since it’s primarily for one single exercise, but also being sturdy and strong enough that you don’t feel like it’ll fall apart when you’re using it. The weight capacity of 500lbs is more than enough for typical use at home, and this one is frankly well-built enough that we wouldn’t be surprised to find it in some professional gyms here and there, too. Since it’s a pretty niche item, you don’t necessarily need to go all out. Are preacher curls one of your favorite exercises? Are you looking for that classic jacked, big-arm, bulging bicep type of workout? It might be worth investing in one of the best preacher curl benches you’ll find for less than hundreds of dollars. You can also find adjustable benches that have an attachment for preacher curls, too, but something a little more basic. It’s not as good as having a dedicated bench like this one, but it can certainly suffice, save space, and make it all easier to fit into your budget. PREMIUM STEEL CONSTRUCTION - Constructed from rugged, foam, and vinyl to provide sturdy exercise gear for long usage, the surge bench is safe and comfortable. The construction is compact and stabilized to provide optimal support for daily workouts! DUAL-FUNCTION LEG DEVELOPER - Dual-features include a pivot point that aligns with the knee joints and a locking mechanism for abdominal exercise, this unit facilitates proper body posture and allows for maximum effect on the targeted muscle groups. SEAT SLIDING TRACK - This exercise equipment boasts an adjustable seat and back pad with a slide track to conform to proper lifting positions. It allows you to achieve the enhanced benefits of an intense workout performed with precise body alignment. WEIGHT PLATE STORAGE POSTS - This complete system features an innovative structure that combines weight plate storage posts and Olympic sleeves. This multifunctional training gear allows you to easily store your two weight plates. VERSATILE FITNESS EQUIPMENT - Designed for full-body training at home, this surge bench can be utilized to target multiple muscle groups. It allows you to perform a wide array of strength-training exercises that focus on the arms, legs, chest, and core. Finally, here’s a versatile Olympic bench. Unlike some of the others, this bench comes with a rack for bench pressing, and it is somewhat adjustable. Now, this is an example of some of the less-expensive Marcy equipment, so it’s not going to feel quite as heavy-duty as the rest. Make no mistake: This is a budget option. If you’re a serious lifter and you’re going to have huge amounts of weight on it and you’re really going to put this bench through the ringer, it would be a better idea to choose something a little more heavy duty. However, if you’re an intermediate or beginner lifter, and looking for something versatile that you can use at home, that will have you covered for a full body workout without breaking the bank – this is a great option. There are posts for storing your Olympic plates, two heights where you can rest your bar, you can do leg workouts, preacher curls, dips, bench press, and a ton more. Looking for a complete setup for a garage gym or basement gym, with a relatively small footprint, that won’t cost you a lot of money? This is the way to go, but just keep in mind that you’re still lifting seriously a few years from now, you might want to think about replacing it at some point. This bench is perfect for getting started but leaves something to be desired when you compare it to higher end, light commercial or high-end consumer-grade benches. Our final thoughts on this is that there is a top bench here for anyone no matter what your goals or the specifics of what you’re looking for. The best bench is going to be relative to you.